Koningshof is a beautiful luxury camping site and is a must-see resort for nature lovers. This location offers a spacious pitch in a wonderful green area. They pride themselves on the peace and quiet of this holiday camping site. There are plenty of outdoor activities within the site, as well as lots of useful amenities. This is a great campsite for any family that wishes to experience nature! 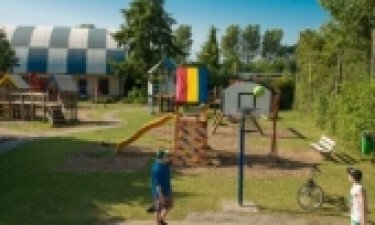 Why is Koningshof the best Campsite for you? There are plenty of different accommodation options available for visitors to Koningshof. There are several different styles of chalet, with most comfortably housing up to five people. Chalets have eating and sitting areas, coming complete with crockery, pans and cooking facilities included. Chalets also come with bedding, and even televisions! You truly can have comfort at this campsite. There are plenty of outdoor activities on site that will enable both adults and kids to enjoy the great outdoors. There are tennis courts, a fishing pond, and even bikes can be rented out for just a few euros per day. With a large outdoor play area for kids, a basketball court, football field, skate park, and outdoor fitness equipment, there’s no doubt there’s an option here for everyone. There are two table tennis tables, a foot bridge, and a slide; everything any child could ever want in a playground! There are two swimming pools at Koningshof; one indoors and one outdoors. The outdoor swimming pool is open from mid-May to Mid-September, and it is heated, with a separate paddling pool for children. The inside swimming pool has a fun slide, as well as a shallow section for your little ones. These days, everyone likes to be connected, even when they are on holiday. Luckily, luxury camping at Koningshof offers free Wi-Fi so that the whole family can stay connected throughout their holiday. Holiday-makers can surf the internet from their mobile home, or as they move around the campsite. If weather conditions affect the Wi-Fi, there are alternate methods of connection. The restaurant Taveerne is available on your luxury camping site, and offers local and international cuisine. There are menus to suit both kids and adults, with opening times encompassing the summer months through until August. 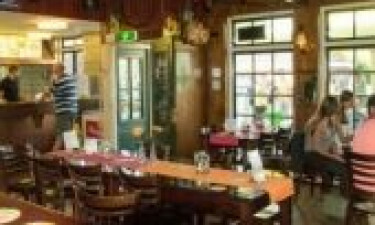 The Big Snack De Heberg has a more relaxed feel, with a terrace for outdoor dining. There is a special children’s menu with their meals being served in fun snack boxes, and you can get food to take away and bring back to your camping area. At Koningshof holiday camping site there is a supermarket available for all your shopping needs. There is a wide range of fruit, vegetables, bread and milk, as well as other cooking ingredients, perfect for amateur chefs! You can also pick up newspapers and souvenirs.